A hot trend in home improvement is to renovate garage space into living space. Often people feel they don't have enough living space but are reluctant to undertake major home renovations. However at times when the lending market is unstable and Americans are hesitant to assume additional debt, they adopt a "use-what-you-have" mentality and look to existing spaces for extra living area. An added benefit to using a garage for living space is that garage spaces are usually set aside from the rest of the living space. This makes it an ideal spot for a home office, an art studio or a private den. Before considering a garage renovation, check your local building codes and pull the necessary permits. Some municipalities may restrict how a garage can be used. Upgrade the windows. Garages usually don't have many windows and therefore lack much natural light. Consider adding more windows for additional natural light. You will of course be able to add recessed lights or spot lights inside the garage, but natural light reduces the amount of energy you use in the room. Skylights and bay windows will not only add light, they will also make a garage feel more cozy and livable. 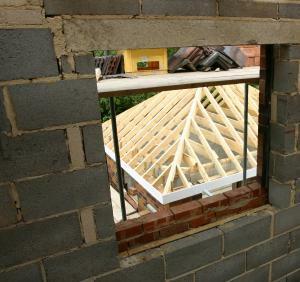 When adding windows, consider well insulated, energy efficient models. Install a new door. Like the windows, the door in a garage is often allows energy to escape. If you are going to renovate garage space into living space, consider installing air tight, insulated doors instead of traditional automatic garage doors. For a real homey look, install sliding glass doors and build a patio or garden adjacent to the garage. Add storage. Turning a garage into a living area can hold some of the same challenges as turning a basement into a living area. Not only do these spaces rarely have closets or adequate storage units, often they are the storage areas for the rest of the house. If that is the case, you will either need to find new storage space, such as the attic or a shed, or hold a garage sale to get rid of unneeded items. Once the space is cleaned out, install shelving and cabinetry to create attractive storage. Typical garage shelving used to hold automotive supplies and sports equipment, won't cut it in a renovated room. Heat the garage. If you don't plan to use the garage room often, or if you live in a mild climate, you may be able to get away with a few space heaters to heat your garage room. However, if you live in a colder climate and plan to use the room on a regular basis, you will need to hire a professional to install heating and ventilation systems. Refinish the floor. When thinking about your garage floor, think about comfort, insulation, sound absorption and design. Carpet, recycled rubber and sheet vinyl are all good options. They come in a wide variety of colors and designs, are soft and resilient underfoot, and they provided needed insulation and sound absorption to the room. Many do-it-yourself stores sell plastic interlocking tiles specifically designed for use in garages. While these tiles certainly work in a garage space, they do not provide any of the attributes mentioned above. Leaving the garage floor as is isn't a very good option either. While stained concrete floors are quite trendy in lofts and retail spaces, they are cold and uninviting in the typical home. Consider aesthetics. If your new room is going to feel like the rest of the house you will need to tie the look into the new room. You may need to add drywall and a dropped ceiling to make the garage more inviting. Choose design elements and paint colors that blend with the rest of your house.